Just the other day I cam across UC Android’s MSRP parser implementation. I was astonished, left speechless. Gazing paralyzed at the code I resisted the urge to run screaming to the development manager and demand that the author of this gem will be publically hanged on the next weekly happy hour. Instead, being the good soul that i am, I decided to take this code as a test case to demonstrate how can we increase Android code efficiency. Can we increase this code efficiency? Maintainability? Performance? Is it worth making the effort? * simple state machine for parsing MSRP messages. // we have the data backed up as bytes so we can delete the string buffer. // start of message "MSRP SP"
// ident 0-9 / A-Z / a-z / "." / "-" / "+" / "%" / "="
Parsing this MSRP message 1000 times, took ~35000 mSec, printing 34000+ log lines, allocating thousands of objects. That’s 35 mSec to parse a message in average! Those with a sharp eye may comment, without arguing, that the test method itself is inefficient. 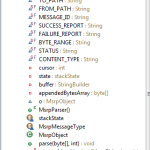 It allocate new parser object for each pass. That’s true. Looking at the heap dump reveals that 48K objects were allocated (of these more than 2000 are classes), and the shallow heap is more than 2M!!! It would have been nice if we could allocate less objects, and give Mr. Dalvik’s poor garbage collector a chance to work more efficiently. Running this again gives surprising results – the parsing time has not changed significantly! The numbers of object allocations and heap size also remained pretty much the same. What is happening here? 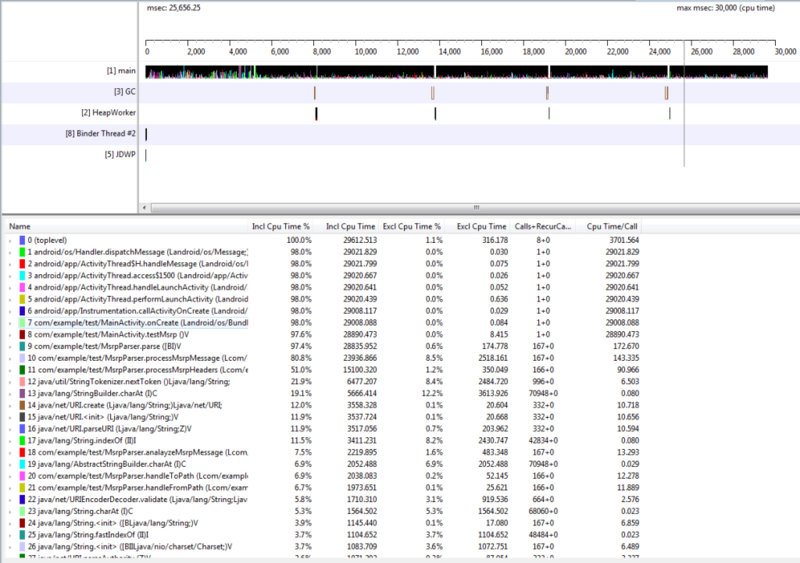 Looking at the heap allocation tracker reveals that most allocations occur inside the StringBuilder when the buffer is growing. Our changes have not mitigated this issue. This shaved a couple of hundreds of mSec from the total parse time (less than half a second). The heap is reduced by less than 1K (but that is expected if we only save 1 byte in each of the 1000 iterations). In this case the effort is not worth while. Maybe the direction should be eliminating the StringBuilder all together? We’ll discuss this in the next case. 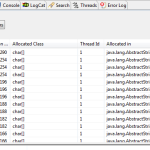 I know they’ve told you StringBuilder is more efficient than String, but is it? This article and this one show that there are cases where String could be more efficient than StringBuilder. It depends on the use case and other factors. In our case the use is to append multiple characters to one single continuous string. The size of transactionId is known in advance, and for this particular case, it is usually agreed that char will be more efficient than StringBuilder. Other references agree that single character operation with StringBuilder has no advantage over char arrays (though it has some advantage over StringBuffer because it is not synchronized like the StringBuffer operations).. Performance and memory allocation figures have not changed significantly. 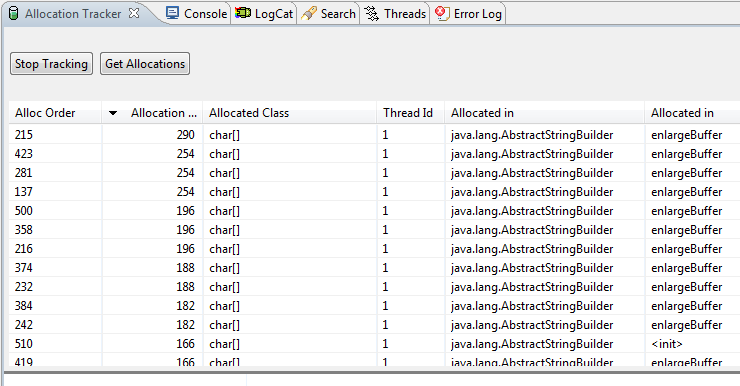 This is probably of the good job the compiler is doing with optimizing the byte code for the StringBuilder code. Without resorting to byte code comparison, it is safe to assume that the efficiency will probably be the same. Unless… What if allocate the char buffer once, and not every parse? and remark line 482. Performance is up by about 5% (we gained a whole sec) and memory figures are down by about 3%. Not much, but still something. This will tell us where we focus our optimization efforts. A lot of time is spent in the helper functions isCharIdent (line 629) and isCharUtf8Text (line 645) because they are called to inspect individual characters during the parse. Let’s discuss them a bit. The whole purpose of the method analayzeMsrpMessage (line 470), and in particular it’s first section (lines 471 to 579) is to check the MSRP message for the proper format by scanning it char by char. Notice how many lines of code where replaced by ~20 lines of reg-ex matcher code. Contrary to my expectation, running this code gave an average parse time of 21 sec. That’s 4 sec less than the buffer/char manipulation code. How did this happen? A possible explanation could be that the char manipulations were not optimized as opposed to the reg-ex pattern which run at the system level. Another possible cause is the buffer copy operation in the original code. The reg-ex operate on the buffer without modifying or copying it. I had to leave the part at the end where the whole MSRP first line is deleted from the buffer (with a little bit more effort this could be getting rid of as well). I don’t really like this way of doing things, but if you are already at it – why do you need line 4? Also consider a well known performance killer – the logger (I’m sure every developer has come to know this silent assassin). If We remove all log lines from the code, the total parse time drops to 7 seconds. That is half a minute less than where we started. I don’t say do not use logs – just use them with discretion. Think before you write your code, and use the appropriate optimization tools after that to optimize it (memory analyzers and method profilers mainly). This entry was posted in Technology, Work and tagged Android by miron. Bookmark the permalink.